Is there a list out there that shows where you can hunt with a suppressor if you are out of state? Assuming, of course, permits and licenses (if needed) are complete. Scenario: I live in TN and have a Trust for my suppressor, I am going to Missouri for a Boar Hunt, guided, can I legally bring my suppressor and hunt with it? I have emailed the game authority in MO. but have not received a reply yet. There was mention that you need to have a C&R License from the ATF to have a suppressor in MO. but those mentions were dated back in 2012, haven't found anything up to date on that so far. The issue might be a state one. Perhaps, you may need to look at MO law. From these 2 site (Link1 Link2) it appears MO is suppressor hunting friendly. Here's one from actual hunters, in state. Generally speaking, so long as it's legal to own a suppressor in said state, it's legal to bring it there, w/o permission from the ATF. No federal laws stand in your way. Thanks, I know Federal Law allows me to move a suppressor across state lines UNLIKE an SBR, but it is the local laws that I am worried about. The C&R was a local requirement, not federal of course. for the states where you hunt with a suppressor. Last edited by mbogo on Thu Apr 11, 2019 1:18 pm, edited 5 times in total. Iowa is kind of a weird holdout. Yes, I had an outdated image. 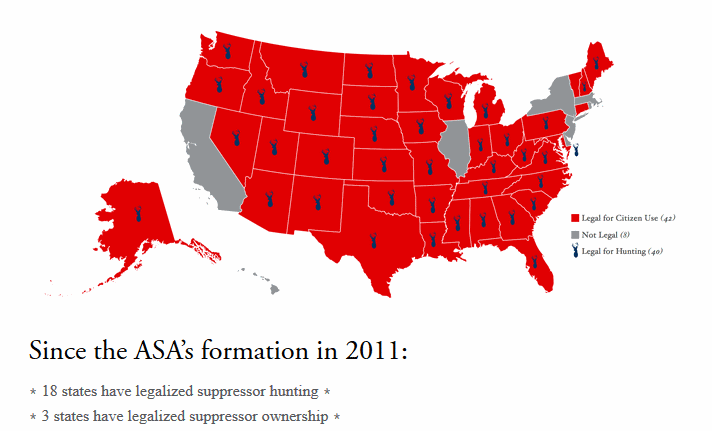 Iowa is suppressor-friendly. If you guys simply read the first reply (mine) you would have seen the link (Link2) already listed.